This page is about the Florida county. For the 2010 novel by John Brandon, see Citrus County (novel). Citrus County is a county located in the U.S. state of Florida. As of the 2010 census, the population was 141,236. Its county seat is Inverness, and its largest community is Homosassa Springs. Citrus County comprises the Homosassa Springs, FL Metropolitan Statistical Area. Citrus County was first occupied about 10,000 years ago and settled about 2,500 years ago by mound-building Native Americans who built the complex that now forms the Crystal River Archeological Site. The site was occupied for about 2,000 years. Why the complex was abandoned is currently unknown. 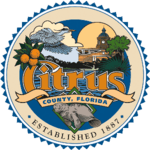 Citrus County was created in 1887. The Citrus County area was formerly part of Hernando County. It was named for the county's citrus groves. Citrus production declined dramatically after the "Big Freeze" of 1894-1895: today, citrus is grown on one large grove, Bellamy Grove; additionally, some residents have citrus trees on their personal property. After the Big Freeze the next major industry was phosphate mining, which continued until World War I. Planned industrial development surrounding the construction of the Cross Florida Barge Canal never came to fruition when the partially-built canal was terminated after environmental opposition. A later attempt to create a port (Port Citrus) from the portion of the canal that was completed resulted in no significant progress and the county voted in 2015 to scuttle the project. The original Citrus County seat was Mannfield (also spelled, incorrectly, Mansfield or Mannsfeld in some sources). The county seat was later moved to Inverness; only a street and a pond remain of the original town. The first library in Citrus County was founded in 1917 in Inverness. Other branches opened in Floral City in 1958, and Hernando in 1959, as well as the freestanding Crystal River and Homosassa Libraries. These libraries joined together to create the Central Florida Library System in 1961. Beverly Hills Library opened in 1970 and joined the Central Florida Library System. A Special Library Taxing District was created by the voters in March 1984. In October 1987, the Citrus County Library System was established which allowed the county residents to administer their own system. Sign on the Withlacoochee State Trail marking the site of the "Great Train Wreck of 1956" at Pineola, Florida. According to the U.S. Census Bureau, the county has a total area of 773 square miles (2,000 km2), of which 582 square miles (1,510 km2) is land and 192 square miles (500 km2) (24.8%) is water. There are a number of uninhabited and/or sparsely inhabited coastal islands that can be accessed via watercraft. While some of the Citrus County islands are state lands thus available for public use for recreational opportunities, many other Citrus County islands are private property and are either wholly or partially owned by private parties. According to the US Fish and Wildlife Services' aerial manatee surveys, as many as 400 of these unique creatures can be found in Citrus County at one time. This typically occurs only during the coldest months of the year. Manatees can also be viewed in the underwater observatory at Homosassa Springs Wildlife State Park. Most of the park's residents are injured animals either undergoing rehabilitation for future release to the wild, or will be permanent due to their inability to be released to the wild. The notable exception is Lucifer, an African hippopotamus that had prior movie roles. When a permanent home could not be found for Lucifer, then-Governor Lawton Chiles named him an "honorary citizen of the state" thus allowing him to remain at the Park. As of the census of 2000, 118,085 people, 52,634 households, and 36,317 families resided in the county. The population density was 78/km² (202/mi²). The 62,204 housing units averaged 41/km² (106/mi²). The racial makeup of the county was 95.05% White, 2.36% Black or African American, 0.36% Native American, 0.76% Asian, 0.03% Pacific Islander, 0.37% from other races, and 1.07% from two or more races. About 2.66% of the population were Hispanics or Latinos of any race. Of the 52,634 households, 19.00% had children under the age of 18 living with them, 58.30% were married couples living together, 7.60% had a female householder with no husband present, and 31.00% were not families. About 26.10% of all households were made up of individuals, and 15.60% had someone living alone who was 65 years of age or older. The average household size was 2.20 and the average family size was 2.60. In the county, the population was distributed as 17.20% under the age of 18, 4.60% from 18 to 24, 19.10% from 25 to 44, 26.90% from 45 to 64, and 32.20% who were 65 years of age or older. The median age was 53 years. For every 100 females, there were 92.30 males. For every 100 females age 18 and over, there were 89.60 males. Citrus County is served by two local airports, Crystal River Airport and Inverness Airport. One rail line operates within the county: A freight line to the Crystal River Energy Complex in northern Citrus County. Other lines that used to run through Citrus were either converted into rail trails such as the Cross Town Trail in Crystal River and Withlacoochee State Trail in eastern Citrus County or abandoned. U.S. Route 19 is the main local road through western Citrus County, running south to north. U.S. Route 41 is the main local road through eastern Citrus County, running south to north. North of CR 48 in Floral City, the road is also shared by the DeSoto Trail. U.S. Route 98 runs northwest to southeast from Hernando County, Florida, and joins US 19 in Chassahowitzka on its way to Perry. State Road 44 runs east and west through the northern part of the county from Crystal River into Sumter County. A county extension south of the western terminus runs into Fort Island. County Road 48 runs mostly east and west through Southeastern Citrus County. It spans from US 41 Floral City winding southeast along the Withlacoochee River, which it eventually crosses on the way to Bushnell and Center Hill in Sumter County, and Howey-in-the Hills in Lake County. The segment in Bushnell between I-75(Exit 314) and US 301 becomes a state road. Throughout Citrus County, County Road 48 is also shared by the DeSoto Trail. County Road 480 is the southernmost county road in Citrus County. It runs east and west from Chassahowitzka with a short concurrency with US 98, then through the Withlacoochee State Forest where it eventually terminates at US 41 in Floral City, south of CR 48. County Road 490 runs east and west from the Gulf of Mexico along the south side of the Homosassa River until it briefly joins US 19-98 in downtown Homosassa Springs only to head northeast towards SR 44 in Lecanto. County Road 491: A Bi-County road that begins in unincorporated northwestern Hernando County, then runs north and south along the western side of the Withlacoochee State Forest, and into Lecanto and Beverly Hills where it curves east in northern Citrus County and crosses US 41 in Holder, only to terminate at SR 200 near the Citrus-Marion County Line. County Road 581: Runs north and south along the eastern side of the Withlacoochee State Forest from County Road 481 in Lake Lindsey, into Inverness where it joins SR 44 east towards US 41, only to branch off on its own as a dead end street on the banks of the Withlacoochee River. Citrus County, Florida Facts for Kids. Kiddle Encyclopedia.